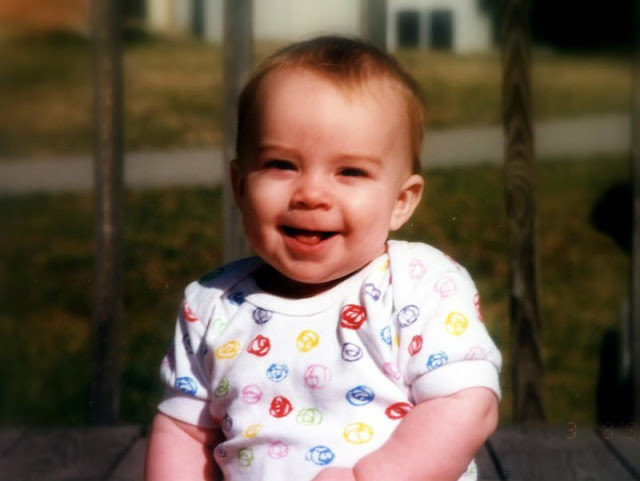 This is my son ... nearly 19 years ago. This is the smile and laughter and light in his eyes that made me so proud to be his mom. What an amazing experience. What a frightening experience! Frightening because this life is developing its first impressions of everything in my care. I made some mistakes. But I also did some great things. And I saw great things in him ... then and now. As the years went by and some of the mistakes went unnoticed or more mistakes were made in trying to make up for the previous ones, the laughter all but disappeared. It's been a personal heartache that the laughter changed, that the light in his eyes dimmed, and that he had to experience anything that got in the way of the amazing person God created to emerge into this world. But I'm humbly changed and thankful and proud. On his own two feet, he is experiencing not just some hard things ... but recently some wonderful ones as well. I won't tell his story, but I will publicly say I am proud of him for following his heart. And as I reflect on motherhood, it makes me reflect on godliness ... makes me want to be closer to God, closer to my children, and a better mother/daughter/friend/sister. I'm so horribly imperfect and a workaholic and sometimes consumed by just making it through the tough places. But I have my feet on the path. And that's a good place to be.